While we’ve seen Spider Ock cross a number of lines the past few issues (including killing a clear-cut villain in Massacre in Superior Spider-Man #5) issue #6 is the strongest demonstration of these dynamics being explored and reaping interesting results. 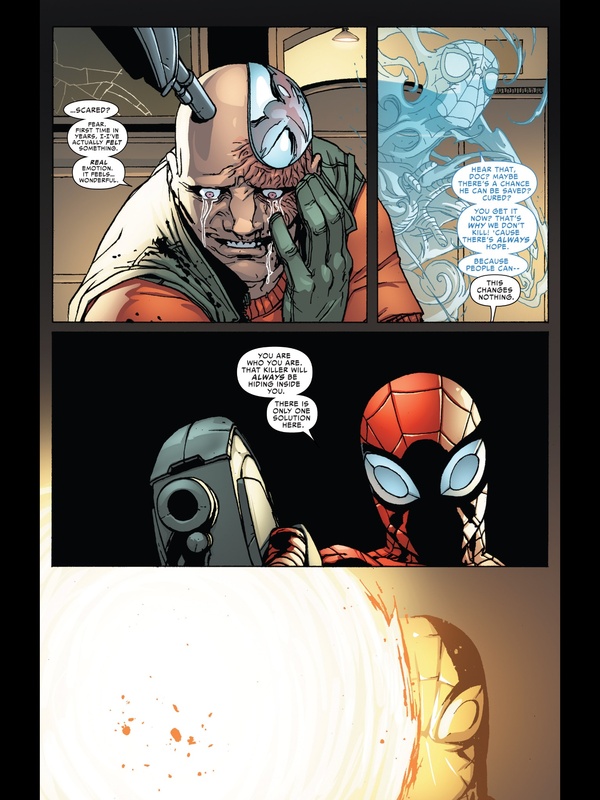 As unnerving as it was to see Spider Ock fire a bullet into Massacre’s head one issue earlier, the heinousness of the action can be justified by the fact that now Massacre would be unable to ruthlessly slaughter innocent people. 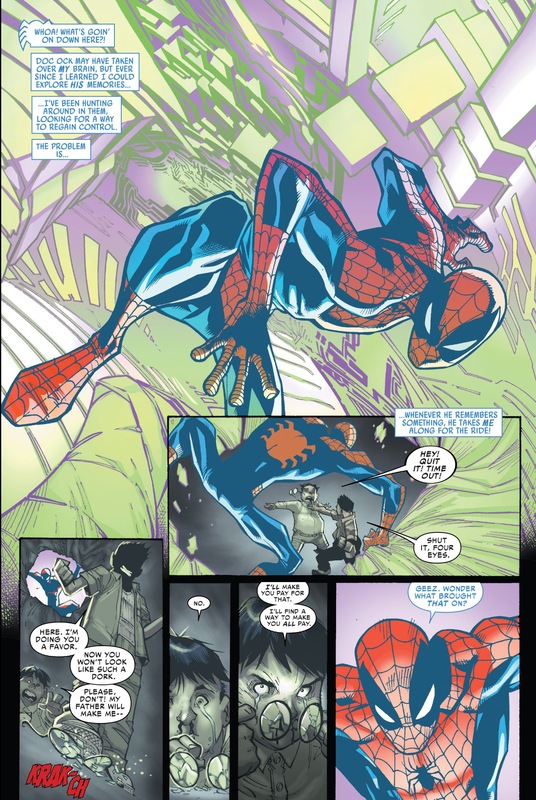 It was a means to an end – a violently final end that Spider-Man has never committed or advocated for in the past – but make no mistake that Spider-Ock’s demented heroics saved lives, even if the Avengers now have their doubts about whoever is occupying the Spidey suit. 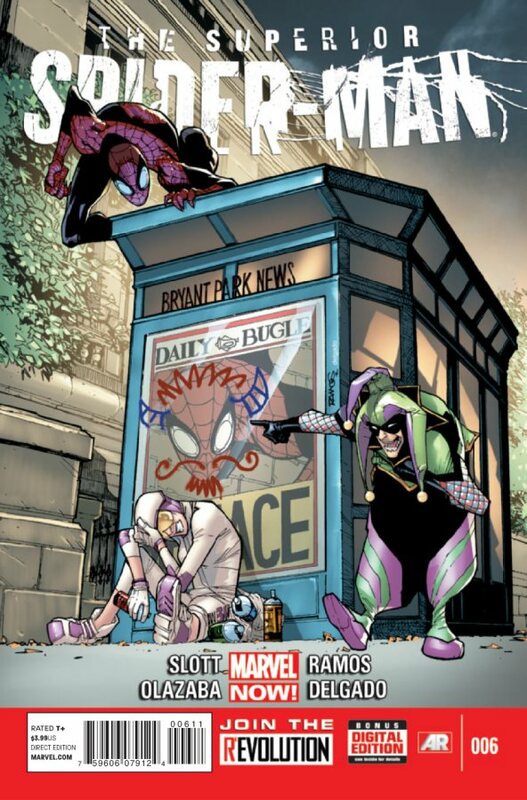 But the vicious beating he doled out for the petty prankster duo of Screwball and Jester at the end of Superior Spider-Man #6, was very hard for everyone to digest and accept. Simply put, a hero doesn’t act like that. And how much of a person’s actions can be traced back to how they were brought up and raised. Going back to the very first appearance of Peter Parker and Spider-Man in Amazing Fantasy #15, it was evident that even as an orphan, Peter received parental love from his Aunt May and Uncle Ben. But that’s not to say that Peter was this warm and fuzzy character. There was edginess – some dark tints – to the character even from the get-go. The iconic cover of Amazing Fantasy #15 has Spidey talking about how the world “mocked” Peter Parker, it would “marvel at the might” of Spider-Man. This is a character with an ego – someone who wants to prove the world that everyone was wrong about him. And yet when his uncle dies, Peter feels personal responsibility for these actions, and thus the heroic mantra of “with great power, comes great responsibility” is born. Perhaps with this familial love, or without that tragic loss, Peter continues to let burglars run by him out of spite as he tries to make big bucks on television as Spider-Man. The topic of bullying is a fantastic way to visually establish the dichotomy here. Again, going way back in Spidey history, I think of how in Amazing Spider-Man #8, when Peter and his high school antagonist Flash Thompson are scheduled to have their big “fight,” Parker has a moment of panic when he realizes he can’t give this bully the beating he deserves because with his super strength, he would just end up killing him. 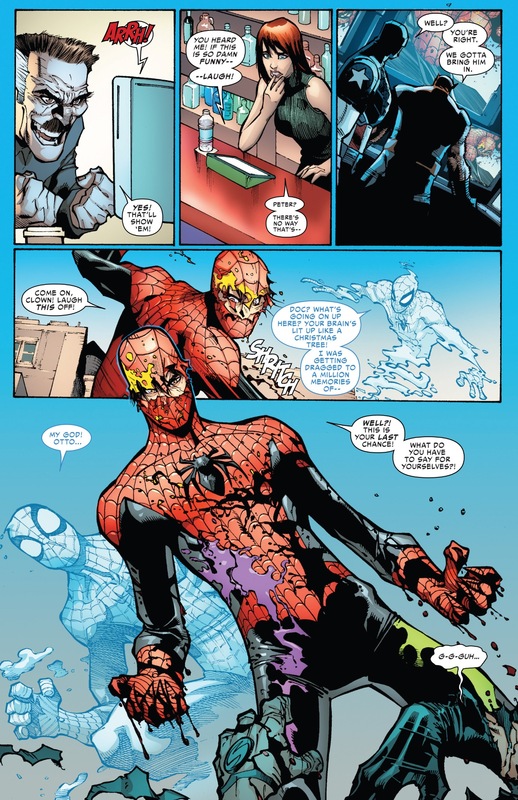 In Superior Spider-Man #6, there are two instances of bullying that Spider Ock reacts poorly to. There are the two dolts who make fun of Anna Maria’s diminutive stature on the campus of Empire State University who Spider Ock, in civilian guise promises to “make pay,” and then of course there’s the dramatic conclusion with Screwball and Jester, who are trying to achieve fame by going viral with videos of themselves pranking others. In both cases, Peter would have clearly left the situations alone, just as he did with Flash back in ASM #8. But Spider Ock escalates both situations with extreme violence, even leaving Jester and Screwball bloodied and battered. And these extreme actions are (seemingly) explained by the fact that Spider Ock is having flashbacks of how he was bullied as child. To a rational person with a sound moral code, Spider Ock’s response seems incredibly unjustified, and yet I would expect if he were to be asked about his violent outburst, he would back up his actions with his own deluded interpretation of “power and responsibility.” By subduing Screwball and Jester, and those ESU bullies, the way he did, he all but guaranteed that they would never bully another person (or Spider Ock himself) again. So, in essence, are these actions not heroic? I guess that depends on whether or not you think Spider Ock is enacting vengeance or justice. And yet Peter was able to overcome his bullies and tormenters and be a better person for it. I know a Spider-Man comic seems to be an odd place to be a case study in sociology, but I personally think it’s a daring direction for Dan Slott and Co. to be going. It’s not enough just to show a more egomaniacal Spider-Man now that Doc Ock is in control. Since such a big deal has been made about the fact that Peter and Otto have access to each other memories, I believe that readers really need to get a sense of how these little (or big) moments in our lives come to define us and the decisions we make years later. Peter and Otto were quite similar until they became quite different. If Slott wants to keep exploring this dynamic, I think he’ll produce some compelling stories, even those that star otherwise D-list characters like Screwball and Jester.